H2S (hydrogen sulfide) is a toxic gas. It is formed in anaerobic conditions. 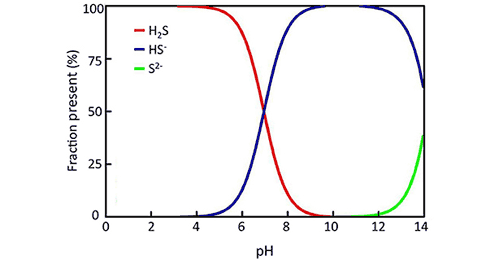 In water, H2S (gas) exists in equilibrium with the hydrosulfide ion (HS-). If the pH is low, H2S will exist in the form of toxic gas. For example, at 24 degrees Celsius, if the pH value is at 5, then 99.1% hydrogen sulfide is in the form of H2S (toxic gas) while the remaining is in the hydrosulfide ion (HS-) form that is not toxic. If the pH level is at 8, only 8% of hydrogen sulfide is in the form of H2S (toxic gas). The presence of H2S (gas) in a continuous period will reduce shrimp and fish reproduction although it appears in a very small amount of 0.001 ppm. H2S concentration in shrimp ponds should be less than 0.01 mg/L.